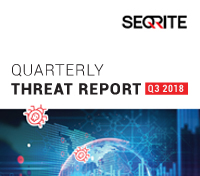 The latest Cyber Security Threat Quarterly Reports from Seqrite details how simple tactics and advanced cyber criminals led to unparalleled consequences in global threat activity. 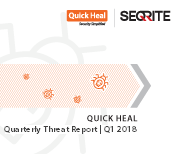 The Seqrite H2 2018 Threat Report gives a detailed insight into the latest security threats and trends identified by Quick Heal Security Labs for enterprises. In this first-ever threat report by Seqrite, we look at the latest security threats and trends identified by Seqrite Security Labs for enterprises during Q3 2018. In Q2 2018, we detected more than 180 million Windows malware. Download the threat report to know what other threats we came across in the last three months. The first quarter of 2018 witnessed some important and worrying trends in the cybersecurity landscape of Windows and Android. A careful analysis of these trends will help us understand what we can expect in the coming months of this year. Download this report to know more. The Quick Heal Annual Threat Report 2018 gives a detailed insight into how the cybersecurity landscape shaped up in 2017 and how it is going to be in 2018. This report has stories you don’t want to miss! Download it now. Quick Heal Security Labs detected 9 new ransomware families in Q3 2017 and over 199 million samples were detected on the systems of Quick Heal users. Download the full report to read these and other security insights in greater detail. Given the number of ransomware attacks that have happened so far, will 2017 be "The Year of the Ransomware"? 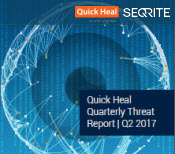 Read more on this and other such important insights into the world of digital security from the Quick Heal Quarterly Threat Report Q2 2017. In Q1 2017, Quick Heal detected over 295 million malware samples on Windows and more than 2 million samples on the Android platform. 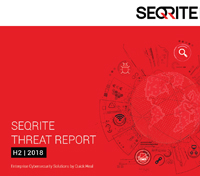 Download the full report to get detailed insights into the present threat scenario and what to expect in the coming months.